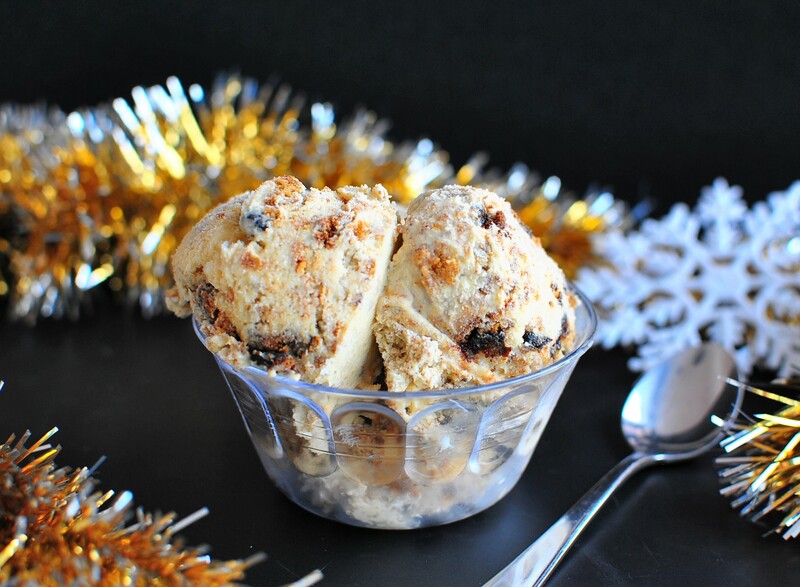 I have to say, I think this Christmas Cake ice cream has become my new festive favourite. What started out as a cake gone wrong, turned into the most delicious Christmas Cake Ice Cream that I have ever tried. I have made a least four Christmas Cakes this year and only one of those we gave away!!!!! My last batch I decided to double, but when I came to spoon the Christmas Cake mixture into the cake pan, it was not all going to fit in. No problem! I thought, I would just make a smaller cake in a smaller pan with the remaining mixture. As I was busy with many other things on my mind, I didn’t even think about a shorter cooking time than the much larger cake that shared the oven. As you can probably guess the cake was dry and slightly burnt on the bottom. ARGGGGHHH I don’t like wasting many things, especially food, so I kept the cake, drizzled it with extra brandy in a vain attempt to save it. It was never going to make it as a Christmas cake, so I then decided to try it as Christmas Cake Ice Cream as I was in the process of making a double batch of our delicious Sugar Free Vanilla Ice Cream. I cut the burnt layer off, then crumbled the cake and poured over Kahlua and coffee and let it sit for about five minutes to absorb the liquid. The result is the most delicious Christmas Cake Ice Cream. crumble cake into a bowl and add coffee and Kahlua and stir to thoroughly combine. Stir cake into ice cream and mix well, place in a freezer safe container and freeze until required. No Replies to "Christmas Cake Ice Cream"